File corruption is undoubtedly a nightmare for any Outlook user. And if you don’t repair PST file in time, you’re likely to lose all your crucial emails and other mailbox data. Luckily, there are many vendors in the online marketplace today which provide Outlook Recovery software. But a wide range of options can definitely make your head spin. I’m sure you’re familiar with this feeling of having too many choices. In this article, we’ll walk through the top 5 factors for choosing the best PST Repair tool 2018. It’s always hard to choose the best solution when you have too many choices. As a computer user, choosing a new software application means you stand at the crossroads. Not only are there so many options from which to choose, but making the wrong decision can result in additional problems instead of fixing the real issue. Moreover, the new vendors are rapidly becoming available in the online marketplace, making it even more difficult to determine which is the right solution. Almost no computer file is immune to corruption. An Outlook data file, commonly known as PST (personal storage table), may become corrupted at any time due to any reason. Although Microsoft provides the Inbox Repair tool scanpst utility to handle corruption and repair PST file, sometimes it may fail in a case of severe corruption. In such a situation, Outlook experts and professionals always recommend using a 3rd party Outlook Repair tool. But how would you choose the best PST Repair tool? Generally, a user takes help of a search engine like Google to meet the searching needs. Google always uses the advanced algorithm to provide the best search results. Let’s suppose if you search “PST Repair tool” or “Outlook Recovery software” on Google, it then returns the most relevant results to your search. There are 10 results per page in Google search which means you have 10 different options to choose from. You can’t say that the option that’s being shown on the top is the right solution for you. You need to be sure before choosing any solution. Narrow down your choice to the one that aligns with your values the most. Whenever I find multiple suitable options, I then choose the one that has the highest potential in terms of features, functionalities, and most importantly user-friendliness. Being a smart user, you should always consider more than just price while choosing something needful. The PST Repair tool provided by Shoviv Software is considered one of the best solutions to repair PST file and perform an effortless Outlook email recovery. There are many factors that an Outlook user needs to consider when choosing the best PST Repair tool. The word availability simply means that something is easily obtainable and ready for use. There are many software download sites on the Internet to download software applications. Generally, vendors upload the executable (.exe) file of their software applications on such download sites so that users can download the software with ease. Also, many of the vendors provide the free demo version of their software applications. So it’s strongly recommended to download the demo version for free evaluation. By using the demo version, you can check the capabilities of the software before purchasing its licensed version. And if you’re satisfied with the demo version, then only you should purchase the software. 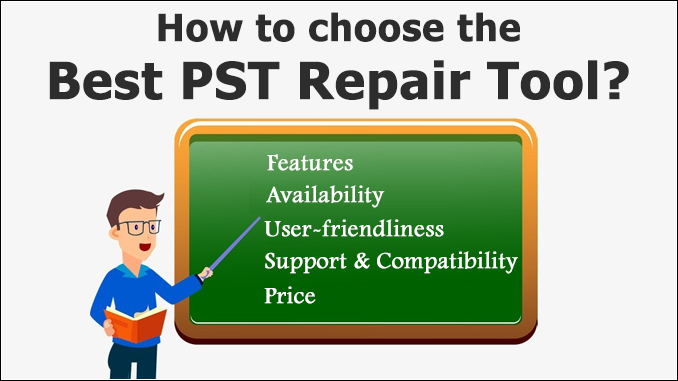 The PST Repair tool provided by Shoviv Software is available with the demo version. The demo version is available on almost all software download sites like CNET and Softonic. By using the demo version, you can scan the corrupt PST file and check the preview of your recoverable data. The saving feature is disabled in the demo version. To save the recovered data into a fresh PST file, you need to purchase the licensed version. This is one of the most important characteristics when it comes to choosing a 3rd party software. A software application should be designed with usability in mind for maximum efficiency and ease of use. A user-friendly interface ain’t overly complex, but instead is straightforward, providing quick access to the common features. Shoviv Outlook Repair tool is one such solution that contains an intuitive interface and requires a minimal explanation for how to use it. Unlike other unreliable products, it doesn’t malfunction crash. Since we’re discussing “how to choose the best PST Repair tool” here, we just can’t skip this very important section, Support & Compatibility. Microsoft has released many versions of its Outlook client, i.e. from 97 to the latest 2016. The Outlook Recovery software should support PST files (both ANSI & Unicode) created by all the Outlook versions. Also, software compatibility plays an important role here. Make sure the Outlook Repair tool you’re choosing, is compatible with all Windows-based operating systems. And the PST Repair tool from Shoviv Software is one of the best solutions in terms of support and compatibility. Pricing is one of the most important factors so never overlook it. Generally, the price of a software application and its value can be faulty sometimes when it comes to quality. Never purchase a software tool just because it has a long list of extra features. Maybe many of those features might not be even required. You should always prefer a solution that meets your requirements at an affordable price. In order to avail the best PST Repair tool, you just need to spend $49, a cost-effective price. Important note: A professional PST Repair tool is a great way to fix corrupt PST file and recover your data from it. However, it ain’t 100% guaranteed that you’ll be able to recover maximum data from it. Moreover, a lot of time and manual effort is required. Therefore, I would recommend you to take backup of your Outlook data file in order to prevent from any loss occurred due to corruption or accidental deletion. Unlike other similar software products, Shoviv PST Repair tool contains a solid feature set, convenient user options, and an extremely easy user-interface with many positive reviews. Corruption can ruin your crucial Outlook data. So it’s better to fix corruption by using a professional Outlook Repair tool. Having too many options always makes it harder to choose. The article explained top 5 reasons you should be considering while choosing the best PST Repair tool. The Outlook Repair tool of Shoviv Software is the best solution in the category of Outlook Recovery software.